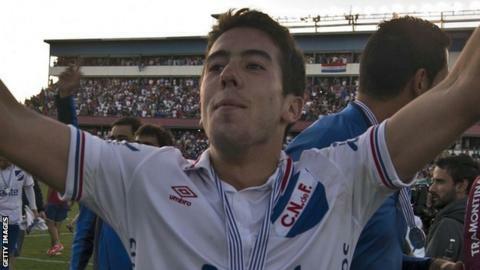 New Middlesbrough signing Carlos de Pena says he left Nacional for a dream move to England having achieved his aim of winning the Uruguayan title. The 23-year-old winger scored 15 goals in 58 games for the Montevideo club, helping them to Apertura and play-off success in 2014-15. Nacional were keen to retain his services but De Pena opted to move to Boro on a three-year deal. "I had the possibility to leave six months ago," De Pena told BBC Tees. "I told the president I wanted to stay because I wanted to be a champion, and we won the championship last season. "I had to play here in Europe, they [at Nacional] were happy for me but not for the way I had to leave." Leaving the champions for Teesside was a tough call for the popular wideman, who wrote an open letter on social media to the supporters. "It's important to show you have a compromise with the club," he added. "I was a fan of Nacional since I was little and I think it was good for me to write a letter explaining things and thanking the club and the fans. "Here in Middlesbrough I had to show the same, this is a great club." De Pena went to Brazil to tie up the loose ends of the deal, with a former Boro star playing a key role in his signing. "I did all of my medical examinations and signed my contract," he said. "Juninho really helped me, so I want to thank him. I was very tired after that day but I was also very happy."